ALL of our products are fully returnable for credit. Over 3000 different Magazine titles! 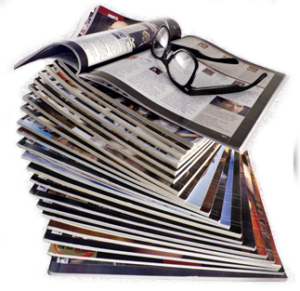 All National and Regional magazines including People, Us, Womans World, Enquirer, Sports Illustrated, Cosmopolitan, Men's Health and many others. Categories include Women’s Titles, Sports, Automotive, Craft, Food & Cooking, Regional and hard to find specialty titles and many others. Novels, Romance, Reference, Westerns and many others. We have all of the kids favorites Coloring and Activity Books. As many or as few as you want. Deeply discounted books for the whole family. Promoted three to four times per year, in and out. Always a new selection of quality books with high consumer value. Promotions are carefully planned and of high value to your shoppers. May include non-traditional items like Baseball Cards or seasonal novelties, or Best selling books, New and Hot titles, Puzzle Books, Hunting or Fishing titles, Cooking, Health & Fitness.